If you've ever walked the streets of San Francisco, particularly in the scruffier parts of The Mission, you know that fennel is an invasive plant species. The stuff is everywhere, although between the lead in SF's soil and the human/animal waste everywhere I wouldn't eat most of it. Although, if it's from a reliable planting, you can eat all of the plant, from roasting the bulbs to seasoning with the leaves and seeds. According to WebMD, fennel is used medicinally for a variety of ailments. You can read all about it here. There is also quite a bit about it on World's Healthiest Foods. Currently, the fennel in my garden is as tall as the fence and several stalks wide. Also, it has passed from tasty, feathery leaves to flowers to seed. While the leaves did their service seasoning meats, salads, and just plain "off the plant" snacking, and some bulbs were roasted, the time has been coming to harvest the tasty seeds. The seeds, by the way, are also great for snacking, but go easy because with the benefits of fennel there are warnings. The Old Chinese Soup Spoon Trick! How do you harvest it? Carefully, unless you want a lot more fennel around. 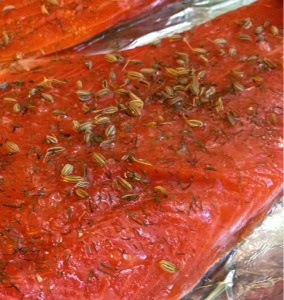 You'll want to cut them straight into a brown paper bag to finish the drying. Also, I'll be honest, while a brown bag of fennel seeds, dried flowers, and stems smells wonderful, getting it down to just seeds is a pain in the rump. 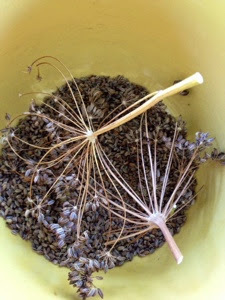 The dried stalks and flower stems are brittle, and once you've either deseeded each flower in a bowl or rubbed them in a bag to get them off of the dried flowers you're still going to be picking through the seeds and pulling out bits of twig. If someone has a better way, I'd like to read about it. This video will give you an idea of my pain. 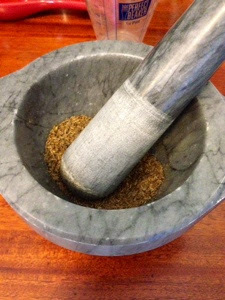 Once you're done, however, you'll have an abundance of fennel seeds for a variety of uses. 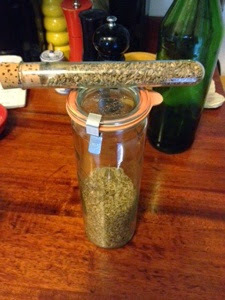 I managed to fill most of a tall jar and a tube in my spice rack with just one round of seed. See above for my easy trick to fill the tube if you have something similar. Just scoop with the big end and pour through the narrow end. So, uses. Like, why not make fennel water? It's a tasty way to hydrate. 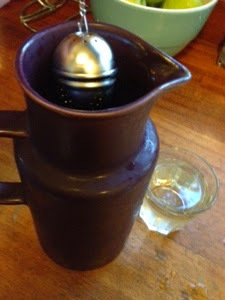 The Old Tea Ball Trick! 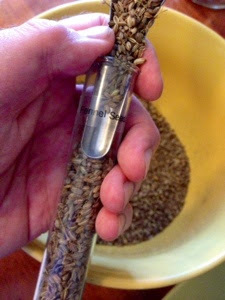 Just use a tea ball to soak the fennel seeds in a pitcher overnight. The seeds will become gorged and will release their healthy goodness for you. You can also make tasty cocktails like The Rear Admiral with fennel-infused bar syrup. Heck, get some wormwood and make your own absinthe. Speaking of infusions, one of my favorite uses of fennel is ice cream. Put the milk, cream, and fennel seeds into a saucepan and heat over low heat but do not allow it to boil. Strain out the seeds, add sugar and whisk until combined. Allow it to cool, covered, and add the rest of the ingredients. Put the lot of it into your trusty iced cream maker. Fennel leaves or seeds are also great on fish. If you don't want a bunch of soft seeds on your filet, grind 'em. Me? I like the seeds on my meats, you dig? If you're not already growing fennel, you should be growing fennel. It's a versatile plant that has hundreds of applications for its seeds, bulbs, stalks, and fronds. Heck, it can even make your smoothies better! Just watch what you plant near it. It's not the best companion plant. Did I mention that it's invasive? Well, it's also territorial and it wants a lot of it. 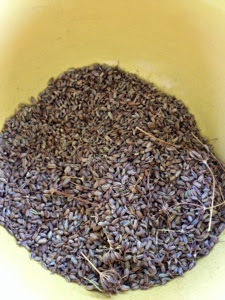 As the fennel goodness keeps on coming, I'm currently on my fourth round of seeds and there's another round, or possibly two, still on the plant. 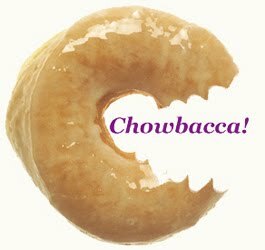 It's challenging coming up with new ways to enjoy this delicious menace. Now, here's an entertaining and informative animation about California's fennel invasion! Enjoy! Taking Out the Sticks. Yay?